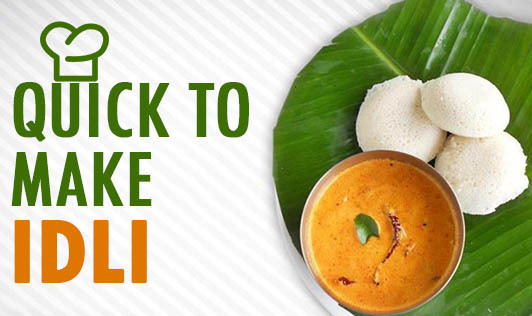 Quick to make idlis are best when you are bored of the regular bland idlis which you normally make. These are a perfect choice when you have no batter and want to have slightly spicy idlis. A must try recipe which would be a good snack or a breakfast option for you and your family. 1. Roast broken vermicelli in 1 1/2 tablespoons of oil till golden brown and keep aside. 2. Roast semolina till light brown in the remaining ½ tbsp oil and keep aside. 3. Combine vermicelli, semolina, curds, salt and 1 1/2 cups of water and keep aside for at least 30 minutes. 4. To prepare the tempering, fry cashew nuts and urad dal in oil till golden brown. Add mustard seeds, green chillies, curry leaves and asafoetida and fry till the mustard seeds crackle. Pour into the idli batter. 5. Add fruit salt and mix well. Immediately pour into greased idli moulds and steam for 10 minutes.